Cycling along Vancouver’s Seawall has benefits year round—or almost. Canadian winters can be harsh, long and tedious, especially for cyclists. Your bike gets put away for months. If you’re a fan of winter sports you may replace it with a set of skis to hit the snowy slopes. However, for Vancouverites, a fairly temperate climate means cycling can happen all year round. Mind you, it can get pretty wet. When spring arrives early, as it usually does in Vancouver, it brings with it the colourful flora and scents that incite that feeling of renewal. 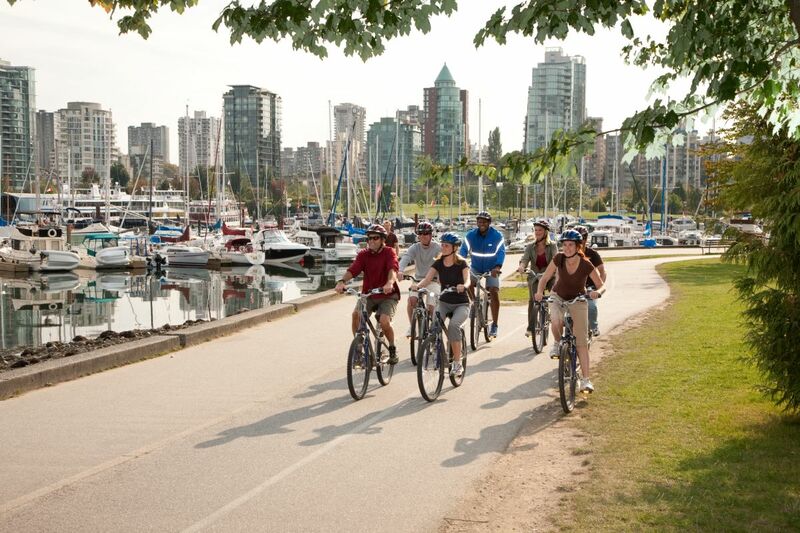 It makes you want to grab your bike, tune it up and cruise along Vancouver’s amazing Seawall. Throngs of visitors and locals cycle along Stanley Park’s 9km trail every day. To make it all the more handy when in town, dozens of bike rental shops line Denman Street, just north of the entrance, making biking a must-do experience when in Vancouver. The Seawall is the world’s longest uninterrupted waterfront path. It weaves past sloping topography, tall cedars and gorgeous views of the Pacific, complete with the snow-capped Rockies looming in the distance. For a moment as my bike glided around a bend and the salty air tickled my nose, I forgot I was in Canada. Stanley Park’s second and third beaches line the rocky shoreline, and each beach along the way evokes an almost Californian surf vibe. It’s the perfect spot to dock your bike and take a few pictures along the way. When I get my bike groove on I just can’t stop, and neither does the Seawall. You can cycle the other side of the Seawall past English Bay and hip Yaletown over to Granville Island and the Public Market (a gourmand’s dream), and even out as far as the ever-popular Kitsilano Beach. The whole journey is 28 glorious kilometres of smooth trail with a bit of sand hitting your tires along the way. High arctic adventure passes through polar bear country.